Bitcoin enthusiasts aside (and there are a lot of them out there, including not just the stereotypical individual techno-libertarians and black marketeers, but some significant financial services companies as well) should people see the underlying blockchain technology as one with significance for their lives? Or is the blockchain nothing more than a flashy hashtag soon to be overtaken by other fads? Peder Müller, Novetta’s Deputy Director of Analytics, thinks the blockchain is significant. 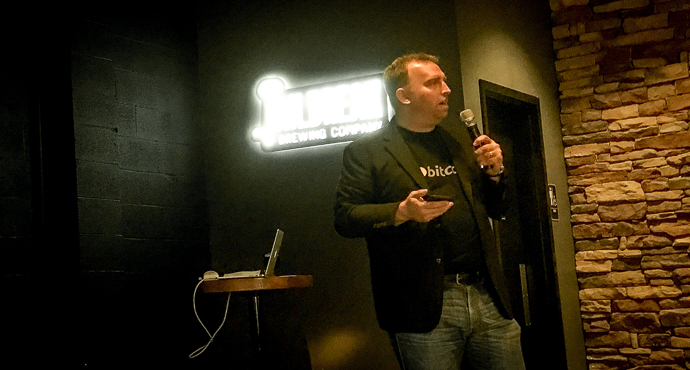 He made the case Monday at the Jailbreak Brewing Company in Laurel, Maryland, to Jailbreak’s usual audience of white hats and developers. Müller declared himself at the outset of his talk as a Bitcoin enthusiast whose interest began in curiosity but has since expanded through his work at Novetta to encompass blockchain technology as such. What’s the blockchain, where did it come from, and how does it work? What about weaknesses and unfinished work? Having reviewed the strengths of blockchain technology, Müller covered some of its weaknesses. Because the integrity of a blockchain relies on many nodes, adoption is a challenge—the more adopters, the better. With a smaller group of adopters, “51% of the hashing power could exploit the longest-chain-wins system. This hasn’t happened yet, but we have come close.” The very size of the blockchain, which lends it its strength, could also become a problem. Blockchains get big, Müller explained. Were Bitcoin to reach the transaction levels of, say, Visa, it would grow rapidly, by petabytes annually. The blockchain, Müller summed up, is really “a way of thinking, way of coding, a way of storing and transmitting data.” He then turned to some of the applications the blockchain has found. Its most famous use is in Bitcoin, a deflationary currency maxed out at 21 million. Bitcoin makes “heavy integration” of elliptic curve cryptography. It uses trustless pseudoanonymous transactions, and it’s proven itself highly reliable and available: “It’s never gone down since 2009.” Today, one Bitcoin today equals approximately $640. Bitcoin’s blockchain is a ledger for its transactions, and you can trace the inputs back to Satoshi Nakamoto’s “genesis block.” Each page of the distributed ledger is cryptographically hashed (and so confirmed) by miners. Mining is no longer something done by private enthusiasts from their gaming rigs. Today, Müller explained, there are huge mining farms, with server racks doing nothing but hashing. Bitcoin is protected by being distributed and hashed. Transactions always refer to a previous transaction, which is where chaining comes in, and a transaction is just signing data over. Bitcoin may be the most successful implementation of blockchain, but, Müller said, “Generally, blockchain’s biggest asset is imagination.” There is, for example, a customizable election service based on blockchain called Votewatcher. It can be used to secure and authenticate any kind of voting whatsoever. There’s Storj, which enables distributed storage of hard-drive space you’re not using. “In Storj, shards are distributed, cryptographically hashed in redundant nodes.” It’s cheap and fast. Müller thinks there remains a need for classical databases, and that there are several conditions under which you wouldn’t want, or need, blockchain. Will one data entry point work? Do you need a central authority? Are you unwilling to trust miners? Do you not need proof-of-work? If the answer is “yes,” then blockchain won’t be for you. Development of DAOs hasn’t been without difficulties—Ethereum had to create a hard fork—and its challenges have included bugs and a difficult learning curve that amounts, in Müller’s view, to an acculturation challenge. Growing popularity will also drive up price, and no one wants to pay an excessive price to run a contract. Legal and social norms remain to be addressed, and, above all, the community needs to think through the implications of buggy code for an increasingly pervasive blockchain. And in Blockchain 3.0? “What if we go beyond smart contracts,” Müller asked, “to, say, automated medical dosing?” He foresees physical security applications approaching rapidly, and he sees the possibility of competitors’ storing their proprietary data with one another. Blockchain can protect all those data, and do so with compromising them. Experts from Novetta and Chainalysis spoke at the Jailbreak Brewing Company on blockchain technology, what it is, where it came from, how it works, and what effect its having on commerce, banking, and, eventually, daily life. Novetta’s Peder Müller, a self-admitted “Bitcoin enthusiast,” discussed the technical principle behind blockchain, strengths and weakness, and its most famous and successful application thus far, Bitcoin. He described what people are doing right now with blockchain, when it’s useful, when it’s not, and when it’s “just snakeoil.” He then explored the likely future of blockchain technology. Chainalysis CEO Michael Gronager contributed his own explanation of how blockchain worked, why it was important, how it was likely to be disruptive, and the ways in which users and regulators were coming to cope with the technology’s implications.